On reflection, I realised I’ve been doing that anyway, even without declaring it officially. I’ve had the suggestion a few times, from a few people, actually. When I first started writing and publishing these IQs in January 2013 (!) I had one very clear rule: publish every day. Inspired by Seth Godin, I was determined to force myself to publish, to “ship” something, even if I wasn’t inspired, or I wasn’t completely happy with it. There were many lessons that came from that approach. For starters, I never ran out of things to say, even when I didn’t have much to say. (Who would have thought?!) I always managed to find something beautiful, creative, or inspiring to publish – even if it was just a recycled quote from some long-dead thinker. I developed a creativity routine, where I would tap into that sacred creative well on a regular basis. On the upside, I loved publishing the IQs and got so much pleasure out of them. I made a strong impact on many people who read and shared them around. I have built a significant body of written work in the archive of these posts. On the downside, I regularly felt shackled to the process; obligated, almost, to publish something, even when it was really difficult or counter-productive. I didn’t give myself any flexibility or reprieve (except for a few short breaks), and there was little room for evolution. Since I ceased publishing in October 2014, I have been on an enormous journey – both physically (around Australia 1.5 times!) and inwardly/spiritually. I have learned many new lessons. I am a reformed “rusher”. I no longer feel urgency to achieve, do, be, conquer, etc – and even when I do get into an urgent/intense state, I don’t stay there for long, I do it for a defined purpose, and I never do it at the expense of my health. I have made peace with my position in my journey – most days – and I accept that I am exactly where I need to be to fulfil on my life’s work. And, I have learned to relax the rules I set for myself. This is the most important one. Said another way, I have learned to lower or eliminate my expectations of myself. This is true most of the time; I am, after all, a card-carrying over-achiever. 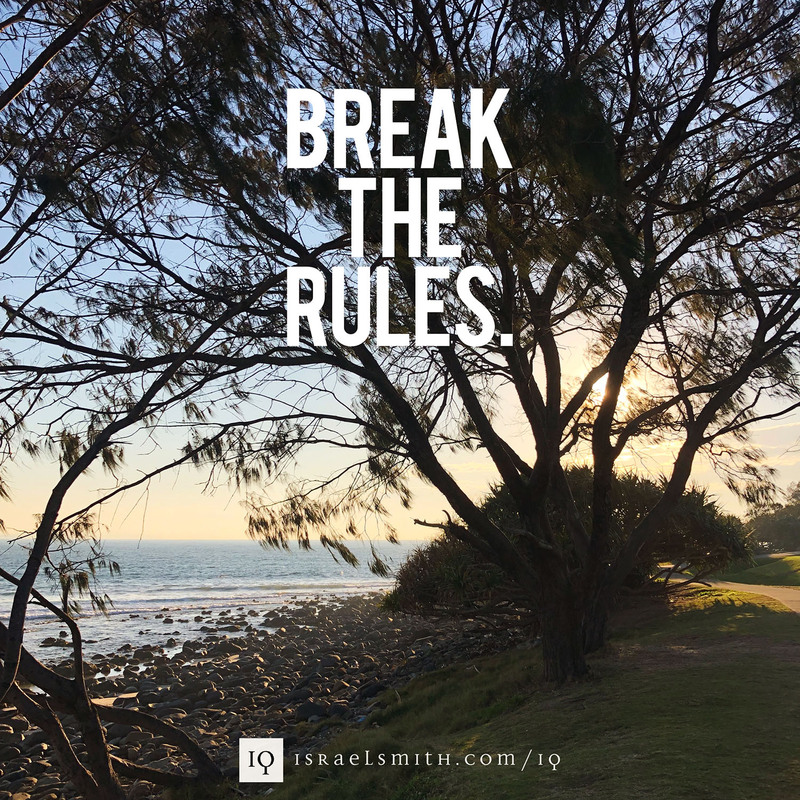 So today’s IQ is about breaking the rules. Whose rules? Our own. Let’s all make a practice of being more kind, more gentle, and more forgiving of ourselves. Let’s remember that we’ve only got one life, and we’re imperfect, beautiful souls. We’re all searching for answers in our own way, but shackling ourselves with unrealistic, damaging, or unhealthy rules is not the way to find them.